And this is why updates have been so few since our move. 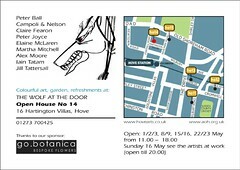 Not only masses to do on house and garden but…a headlong gallop into Artists’ Open Houses here in Brighton and Hove. sculpture, photography, acrylic paintings on canvas, garden furniture and art, ceramics, illustration, silver and glass jewellery, metal sculpture, audiobooks and my own mixed media work. Wonderful wonderful things will be here during the month of May : come and check out that the Wolf will truly be at the Door! This entry was posted in All on April 22, 2010 by Jill. This is the up-date on the Christmas card image, the first piece I have started and finished in Brighton/Hove. A familiar, even hackneyed image here, but the sharp outline of the roofs with the glittering sea behind – in early Spring – is mesmerising and I simply had to have a go. 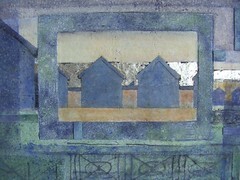 Even though I found it very hard after seeing all those other photographs and paintings of beach huts. The dearth of posts is due entirely to the huge amount of work in getting ready for Artists’ Open Houses here in May. There are three layers of administration: the House, the local (Hove Arts) trail, and AOH central. 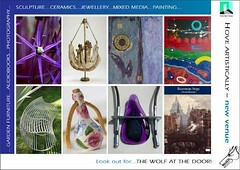 More of our Open House shortly – it’s going to be a terrific line-up of nine artists so watch out for…The Wolf at the Door! This entry was posted in All on April 13, 2010 by Jill.